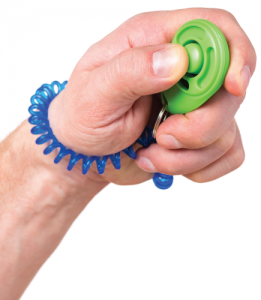 You can purchase a dog clicker for about $3 on Amazon. If you don’t own a dog, this is not a useful piece of information. I don’t own a dog, and the first time I heard the phrase dog clicker, I thought—I think understandably—that it was some sort of remote control. If you don’t own a dog, but you have seen one of the films in the Jurassic Park reboot, then you have seen a dog clicker in action: It is the device Chris Pratt holds in his hand as he tries to convince his pet dinosaur not to eat him. It is essentially a piece of plastic that makes a clicking sound when a button is depressed. Its purpose is reinforcement. Everyone knows about using treats to train your dog. But how does the dog learn exactly what action you are rewarding? Is it the sitting, the panting or the soulful look in his eyes? That’s where the clicker comes in. The dog learns to link the clicking sound to the reward, so he knows exactly what he is doing right and has even more motivation to do it again. There was no reason for me to know any of this until a trainee—much to his immediate regret—directed me to a story on National Public Radio about the use of a dog clicker in medical education. It’s a really interesting strategy. When I leave a clinic room with a fellow and say, “Good job,” how does the trainee know what I’m complimenting? Was it the nice way she explained how to use the autoinjector? Was it his deft skill with the Finkelstein maneuver? With Dr. Levy’s technique, it would be obvious; they would just hear a click. As I thought about how to incorporate a dog clicker into my precepting style, I knew how it would end—with my bloodied corpse dumped unceremoniously in some distant corner of the parking lot. The list of suspects would be obvious, and while I would like to think the dog clicker would be found clutched in my hand, you and I both know the autopsy would find the clicker somewhere less comfortable. I just don’t see my fellows taking well to being clicked at all day. But it brings up a valid point: Are there better ways to teach? If you are of a certain age, you probably remember the scene from Ferris Bueller’s Day Off, in which Ben Stein is giving a lecture on economics to a progressively disengaged class. “Anyone, anyone?” he would ask, rhetorically, before moving on to his next point, barely pausing for the answer that never came. As the joke plays on in the movie, Ben Stein is eventually replaced by a reel-to-reel tape recorder, which seamlessly takes the place of the lecturer at the front of the room. Although entirely orthogonal to the movie, it was a sly commentary on higher education—if all the teacher does is recite facts, why does he even need to be in the classroom? In the movie, the students are also, eventually, replaced by tape recorders, dutifully recording the lecture playing at the front of the room. While this was intended as a joke, it was prescient; across the country, medical students are sleeping through their lectures, knowing they can download the audio at a later date and use it as background music for their next workout. Thus, we come to the concept of the flipped classroom. In 2006, Colorado chemistry teachers Jonathan Bergmann and Aaron Sams decided to invert the natural order of things.4 Their students would watch recorded lectures of the material at home and then come into class to participate in activities—the erstwhile “homework”—under their watchful eyes. By switching to a flipped classroom, Prober and Heath succeeded in making their class at Stanford more popular—they reported that after they adopted the flipped-classroom technique, student attendance at their core biochemistry class increased from 30% to 80%. As an educator, frankly, I find that’s a lot of extra work to put into teaching for a lousy 5% improvement. The universal truth about educators is that we are all underpaid. I have intermittently informed my fellows that faculty actually lose money by teaching, because it pulls them away from seeing patients, writing grants or other activities that actually put money in their pockets. Mumper’s experience does give us hope, however, that better paradigms for learning exist than see one, do one, teach one. We are just now at the cusp of a reexamination of how we learn, and that 5% improvement is likely just the harbinger of more advances to come. What about the accidental teacher? Concepts like the reversed classroom are great for that once-a-year lecture you give to the rheumatology fellows, but if you are like me, the bulk of your teaching likely occurs on the fly, either on your way in or out of a patient’s room. Such drive-by teaching is not generally amenable to multiple choice pretests or small group discussions. Some people are gifted teachers. We all know them. Some people are great at breaking down complex topics into their component parts and teaching us how to do the same. We instinctually seek out these teachers, ambushing them in the hall at the end of the day or sending them an imposing email about a topic we can’t quite grasp. What makes these gifted teachers different from the rest of us? There probably is no such thing as a gifted teacher. Now that I’ve said all this, I feel comfortable saying one more thing: Victor McKusick was an awful teacher. I joined Johns Hopkins toward the end of his career, and not knowing when he might retire, I made a special effort to attend every lecture he gave. His lectures were a mess. There’s an old story from the pre-PowerPoint days: The projectionist dropped Victor’s slide carousel just before a lecture and all of the slides ended up on the floor. Not knowing what to do, the projectionist rapidly collected the slides and put them back into the carousel, albeit in some gravity-determined order. Victor apparently didn’t notice. According to the story, members of the audience came up to him afterward to compliment him on what they thought was one of his best lectures. After having spent many hours listening to him speak, I have no doubt the story is true. It is one of the ironies of medical education that experts in a given field are not always experts in teaching about that field. In taxonomic terms, the educator needs three forms of knowledge: knowledge of the topic, knowledge of the audience and knowledge of how to communicate the topic to the audience. A hard truth: There probably is no such thing as a gifted teacher. Learning how to teach well is hard work, and thinking of it as a gift discounts how much work great medical educators put into their craft. The good news is that, like any skill, one can learn to become a gifted teacher. Now, a second hard truth: You have to learn the script. One does not expect to deliver Hamlet’s soliloquy by reading off the cue cards. In the same way, you have to learn your script well enough that when the opportunity strikes, you are ready for your closeup. The good news is that learning to teach from a script is freeing; learning the material so well leaves you free to improvise, so you can tailor the lesson to your audience. It also, frankly, decreases the cognitive load of teaching, so that part of your mind is free to observe and to respond. Teachers who appear to be gifted have many of these teaching scripts ready to go. Although no one wants to just sit down and memorize scripts that may or may not be useful at some point, as you learn something new, it’s not a bad idea to break it down in terms of pearls and pitfalls and imagine how you might teach a trainee about that topic. Also, you don’t have to do this alone. Plagiarism is the highest form of flattery, and when you are learning from a gifted teacher, take a moment to think about the mechanics: What is making the lecture especially effective and what you can appropriate and try to pass off as your own flash of brilliance? The ability to teach is like any muscle; it gets stronger with use. We have all benefitted from extraordinary teachers, and even if teaching is not your full-time avocation, it is worthwhile to learn how to pay that gift forward and learn how to share what you know even more effectively. Just don’t click at anyone. Philip Seo, MD, MHS, is an associate professor of medicine at the Johns Hopkins University School of Medicine, Baltimore. 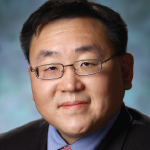 He is director of both the Johns Hopkins Vasculitis Center and the Johns Hopkins Rheumatology Fellowship Program. Vedantam, S. Clicker training for dogs is adapted to help surgeons learn quickly. NPR. 2018 Jun 12. Sousa D. How the Brain Learns, 3rd ed. Corwin Press: Thousand Oaks, Calif., 2006. McLeish J. The Lecture Method. Cambridge Institute of Education: Cambridge, U.K., 1968. Bergmann J, Sams A. Flip Your Classroom: Reach Every Student in Every Class Every Day. ISTE: London, 2012. Makice K. Flipping the classroom requires more than video. 2012 Apr 13. Prober CG, Heath C. Lecture halls without lectures—A proposal for medical education. New Engl J Med. 2012 May 3;366(18):1657–1659. Meyer R. The post-lecture classroom: How will students fare? The Atlantic. 2013 Sep 13. McKusick VA, Reagan WP, Santos GW, Webb, GN. The splitting of heart sounds; a spectral phonocardiographic evaluation of clinical significance. Am J Med. 1955 Dec;19(6):849–861. McKusick VA, Harris WS, Ottesen OE. Buerger’s disease: A distinct clinical and pathologic entity. JAMA. 1962;181:5–12. Jeghers H, McKusick VA, Katz KH. Generalized intestinal polyposis and melanin spots of the oral mucosa, lips, and digits: A syndrome of diagnostic significance. N Engl J Med. 1949 Dec 29;241(26):1031–1036. Custers EJ. Thirty years of illness scripts: Theoretical origins and practical applications. Med Teach. 2015 May;37(5):457–462.